We’ve all heard about how Cal Ripken Jr. saved baseball following the 1994-95 strike with his consecutive games streak, but did you know he saved the Democrats on Sept. 6, 1995, as well? Former Rep. Martin Frost, a Texas Democrat, writes in The Hill this week about how Cal indirectly helped raised $150,000 for the Democratic Congressional Campaign Committee on his record-breaking night. For months I had been harassing Maryland Democratic Reps. Ben Cardin (now a U.S. senator) and Steny Hoyer (now House majority leader) to put on a DCCC fundraiser in Baltimore. They had multiple excuses about why it wouldn’t work, but I did not give up. Finally, one day in the middle of the summer, they approached me on the floor of the House and said they had an idea. 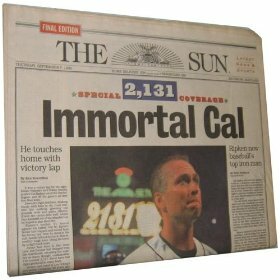 What about a fundraiser at Camden Yards the night Ripken broke Gehrig’s record of 2,l30 consecutive games played? The owner of the Baltimore Orioles was a big Democrat and had offered to provide a 75-seat party box in left field for our use that night. It was an inspired idea. So, on Sept. 6, 1995, the DCCC held a fundraiser at Camden Yards. It was a spectacular evening. Ripken hit a home run to left field (near our box) in the fourth inning and then did a victory lap around the perimeter of the field (passing just under our box) at the end of the fifth inning, when it had become an official game. We raised $150,000 for the DCCC, and people called me the next morning to thank me for having a fundraiser at the park that night. See this “Flashback Friday” post about Cardin’s 1989 Congressional Resolution.